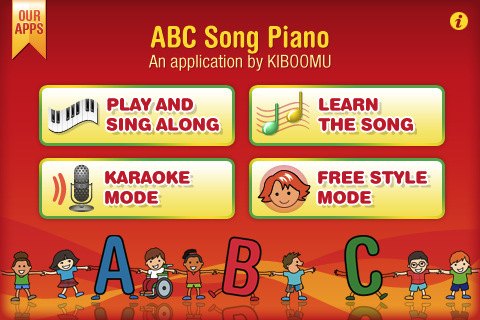 Developer Quote: "All your child has to do is press the piano keys & sing along to our ABC Song." As a child, I wanted a piano more than anything. I was fascinated by using my fingers to create music, but though I begged my parents for a piano, I had no luck in persuading them. So how did this story end? Well, I got myself a piano as soon as I could as an adult. It was a beautiful, black, shiny one much like you see in stereotypical images of a piano. Almost all kids have a fascination with musical instruments. I have read studies which prove that learning notes, theory and playing instruments is a great way to increase mathematical learning capabilities and concentration in general. Well, when kids can sing along to learn letters and numbers, then you really have a good thing going! ABC Song Piano is just such a beginner's app for music-loving children to teach them their ABC's using the classic melody which is the same as that of "Twinkle Twinkle Little Star"! When you open this charming children's app, you will notice 4 colorful buttons labeled: Play and Sing Along, Learn The Song, Karaoke Mode and Free Style Mode. If you choose Play and Sing Along, you can tap Start and the keys will become highlighted to show which ones to tap to play the song to go along with the singing. Okay, so I got a little fancy and began playing the accompaniment along with the traditional melody as you can tap other keys in addition to the notes of the song. It really sounded good to me! 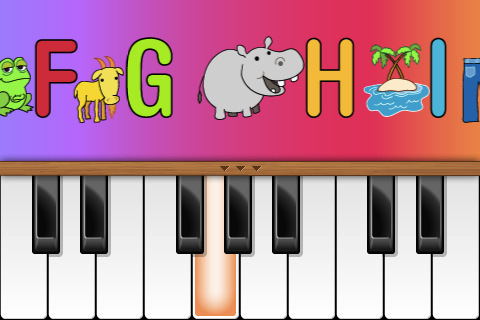 Colorful objects scroll along the top of the piano denoting the letter of the alphabet being sung. You may tap Record to make your own song and then Playback to hear it afterwards. 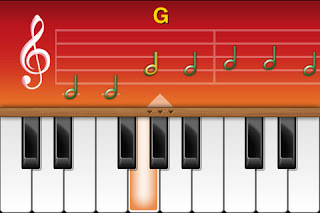 If you tap Learn The Song, the notes of the song on the clef will actually scroll along highlighted with the letter of the note clearly shown above each. Try Karaoke Mode in which the melody plays but there is no voice so that your child can sing his letters all by himself or herself. This is a great way to learn and is made simple by the letters and words appearing on top of the piano so that you sing the tune accurately. Free Style Mode lets you tap the notes with no highlighted keys, but by now, your child may well have learned exactly where to place their fingers. 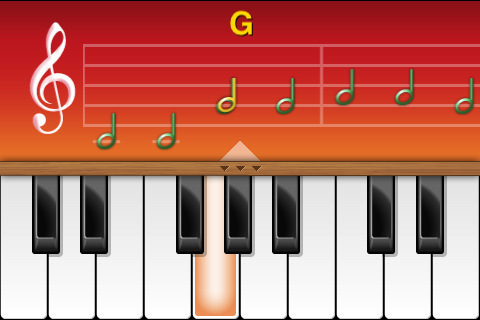 Tap the center of the piano to produce the menu at any time and the Back button to return to the Main Menu. As your child masters the alphabet and this tune, he will be delighted with his new skills. But when he actually starts playing the song on the piano with no help, then it will be your turn to be extremely proud! Playing a musical instrument gives a child remarkable self esteem and pride in accomplishments. It serves to fine tune motor skills and coordination and helps young ones to focus on tasks. 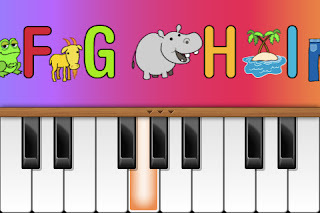 I would definitely recommend ABC Song Piano as an excellent way to round out your children's knowledge while polishing them up artistically and musically as well! COOL CONCLUSION: "ABC Song Piano is a colorful, musical and educational app to bring out your children's talent while learning the basics of music and ABC's!" --iOS/Age Rating: This app requires iOS 3.1.2 or later. iOS 4.0 Tested. Rated 4+. --Tip/Tutorials: 50% off. Regularly $1.99. Get the goods on Cool iPhone Apps, Accessories & News right HERE. RainbowKey Keyboard-a color keyboard with HD background themes, fancy fonts and fun emoji. *See other previously Featured posts also. Dress up your phone every day to add a little swag to your style. With Cool Mobile Accessories, you can easily have a variety of cases and accessories at your disposal. © Copyright 2009-2018 Cool iPhone Apps, Accessories and News Cool iPhone Apps, Accessories and News. Designed by Bloggertheme9 | Distributed By Gooyaabi Templates. Powered by Blogger.